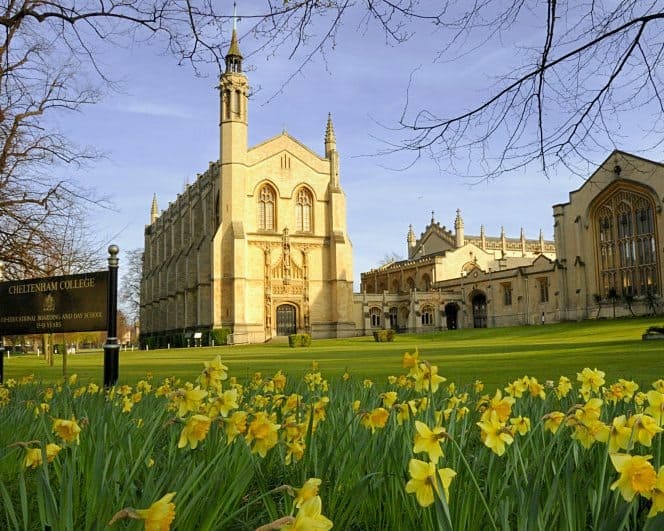 Nestled in the heart of town, Cheltenham College is an exceptional day and boarding school for girls and boys aged 3 – 18. Educating young people since 1841, it has an enviable reputation for academic excellence and developing pupils beyond the classroom – from drama, to music and on the sports pitch. The beautiful campus blends historic buildings, including the 19th century Chapel and Hogwarts-style Dining Hall, with state-of-the-art science laboratories, Steinway pianos and brand new Astro-Turf pitches. Although extremely proud of its impressive facilities, Cheltenham College firmly believes the truth behind its success is the first class teaching and pastoral care on offer. Pupils flourish under the guidance of dedicated teachers who are leaders in their subject fields. This combined with small class sizes and academic rigour are reflected in 2017 exam results with 82% of A Levels graded A* – B, 1 in 3 pupils gaining at least one A* grade, and 58% of GCSE grades were A* – A. All Lower Sixth students now undertake an Extended Project Qualification (EPQ), a nationally recognised qualification worth half an A Level, alongside their chosen A Levels, and they have the opportunity to join the prestigious mini MBA programme – one of the first in the country. Other electives offer volunteering in the local community, including work experience in hospitals, care homes, primary schools and sports clubs. We believe that this offering not only expands our students’ breadth of learning and experience at Cheltenham College, but strengthens their UCAS applications as well as better preparing them for life after College. Whilst academic excellence is at the heart of Cheltenham College, pupils are encouraged to thrive outside of the classroom – whether that is on the hockey or rugby pitch, in the swimming pool, on the stage practising for The Great Gatsby, or playing the bass guitar in the House music competition. The senior school (aged 13 – 18) is a traditional full-boarding school, with 80% of pupils boarding, and both day and boarding pupils having lessons and sports matches on a Saturday so the school never feels empty on the weekend. Cheltenham College will reach equal numbers of boys and girls for the first time this September, as the second part of a new girls’ day and boarding house, College Lawn, opens to meet growing demand for quality girls’ education within a co-educational environment in Gloucestershire.